Exhibition: 25 November – 17 December 2017. Details here. Everyone welcome! Free! Refreshments provided! The purpose of this workshop is to discuss the impact of urban transformation on small urban spaces and local communities. It aims to draw attention to the importance of local heritage in tangible and intangible terms. The history of Miyakobashi Shopping Street in Yokohama can be regarded an example for “best practice” in the preservation of local heritage. Constructed in 1964, just in time for Tokyo’s Summer Olympics, Miyakobashi Shopping Centre transformed a formerly cluttered black market area into an orderly urban marketplace. 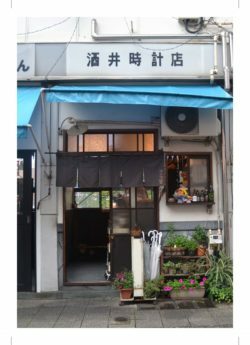 Over several decades, courageous women converted Miyakobashi into the vibrant entertainment block it is today. 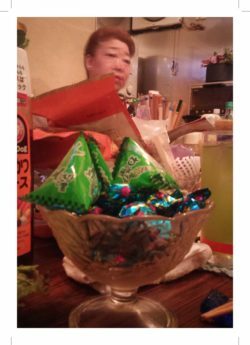 Questions asked include: Why are small urban places, such as Miyakobashi Yokocho, important for urban life and the community? What did it involve to save the building? What kind of social movement does it take to save a building and the community embedded within and around it? The workshop forms part of a research project funded by the Daiwa Foundation, Great Britain Sasakawa Foundation, University of Manchester, Manchester Metropolitan University and the Economic and Social Sciences Research Council (ESRC), UK. The research explores urban transformation in Japan between the Tokyo Olympics 1964 and 2020. 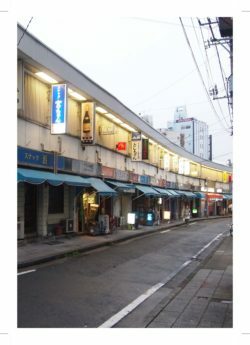 In particular, it focuses on Miyakobashi Yokocho in Yokohama, which is home to sixty-one lift-sized spaces: “sunakku” (snack bars), frequented by business men, local residents and the occasional tourist alike. It reveals the importance of small urban spaces as community anchors, especially as they face the pressures of urban redevelopment in view of Tokyo’s Summer Olympics 2020. Constructed in 1964, just in time for Tokyo’s Summer Olympics, Miyakobashi Shopping Centre transformed a formerly cluttered black market area into an orderly urban marketplace. Over several decades, courageous women converted Miyakobashi into the vibrant entertainment block it is today. The current project exhibition at Koganecho’s Site-A Gallery depicts Miyakobashi Yokocho in drawings, photographs and text resulting from the work of architecture students over the last two years. It is open 25 November – 17 December 2017. In its first part, this presentation explores the fate of local communities and small-scale urban spaces in light of urban redevelopment preceding the Beijing and London Olympics in 2008 and 2012, respectively. In Beijing, it looks at efforts to “civilise” unruly informal neighbourhoods occupied by rural-to-urban migrants; in London, it looks at the gentrification of a low-income Bangladeshi area in the East End. The second part turns to the story of Miyakobashi Shopping Center in Yokohama to trace how brave women appropriated the modernist building to serve their needs and how it is currently changing in response to the requirements of a new generation. The talk concludes with thoughts on the relationships that shape socio-spatial processes in the contemporary city. Miyakobashi Shopping Center building is located along the Ookagawa River in Yokohama. It was built in order to clear up black market stalls around Noge area after World War II. This construction history gives the building some peculiar sense. Also, the building was constructed occupying both road area and river area, and the architecture is arch-shaped, making good use of the shape of the Ookagawa river. This presentation will report on the construction history and spatial features of the Miyakobashi Shopping Center building. Since 1980’s, conservation of historic buildings and monuments is the one of the major issues in urban design practice in Yokohama. Until now, 92 structures are authorized among 206 registered historic buildings and monuments. Most of them were built before 1945 and the Miyakobashi building was constructed in 1964 and is the first case of the conserved buildings in 1960’s. In this presentation, conservation of post-war urban heritage will be discussed.